Part of the ‘Cross’ range of living room furniture. The pocket under the table top provides ideal storage for magazines and books. Part of our ‘Cross’ range of living room furniture. 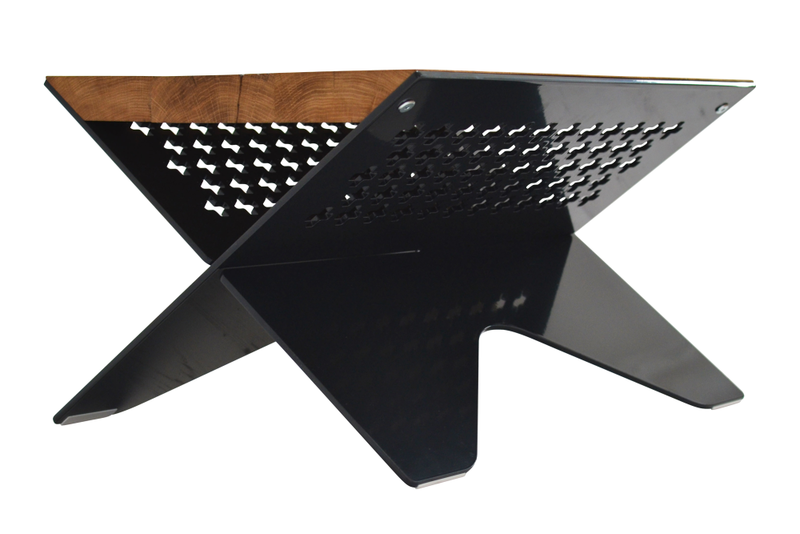 This coffee table is made from 6mm thick laser cut aluminium and reclaimed French oak. The pocket under the table top provides ideal storage for magazines and books. The Oak used in this coffee table originally served as flooring and walls of French Railway Wagons hauling goods for the SNCF (Société nationale des chemins de fer français). These wagons are up to 100 years old and are nearly all now decommissioned and replaced with less romantic steel versions. When we first get our hands on the Oak boards they are coated with decades of soot from the old steam trains that hauled them. Hiding under that soot lays an incredible timber full of characterful burls, knots and cracks. Time has allowed the soot to seep into the cracks and holes beautifully highlighting them in jet black.